Hillary Clinton is kicking off the election year with a trip to the Bay Area. Former Secretary of State Clinton had two appearances scheduled in San Francisco on Friday. She was also expected to attend an evening fundraiser in Palo Alto at the home of a venture capitalist. Hundreds of supporters and their children showed up to meet Clinton at San Francisco's Palace of Fine Arts. Every one of them paid $2,700 to meet, greet and take a photo with the presidential hopeful. 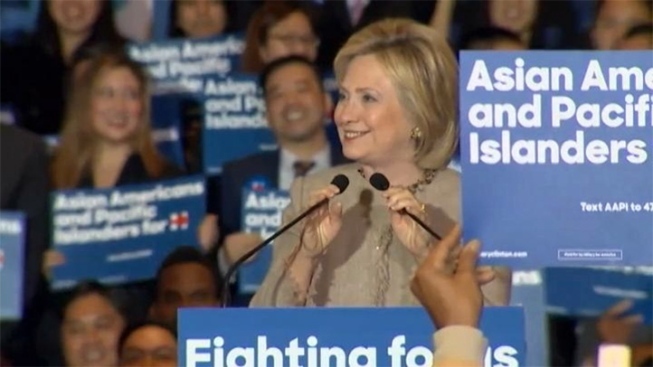 The Democratic presidential candidate was in Southern California on Thursday. She spoke to a group of Asian Americans and Pacific Islanders. Clinton criticized Republicans who she says characterized immigrants as drug dealers. A Field Poll released earlier this week shows Clinton maintains an 11-point lead over Bernie Sanders among likely voters in California’s Democratic presidential primary. Another Field Poll, focusing on the Republican candidates, shows Ted Cruz and Donald Trump atop the GOP presidential field in California. But, other poll data show Trump to be in a much weaker position among this state's Republicans, as well as its overall electorate. Early Friday morning, the State Department released another 3,000 pages of emails from the former Secretary’s private email account, missing a court-ordered goal for their production by a week. The department said the documents include 65 that contain information that has subsequently been deemed "confidential," the lowest classification.